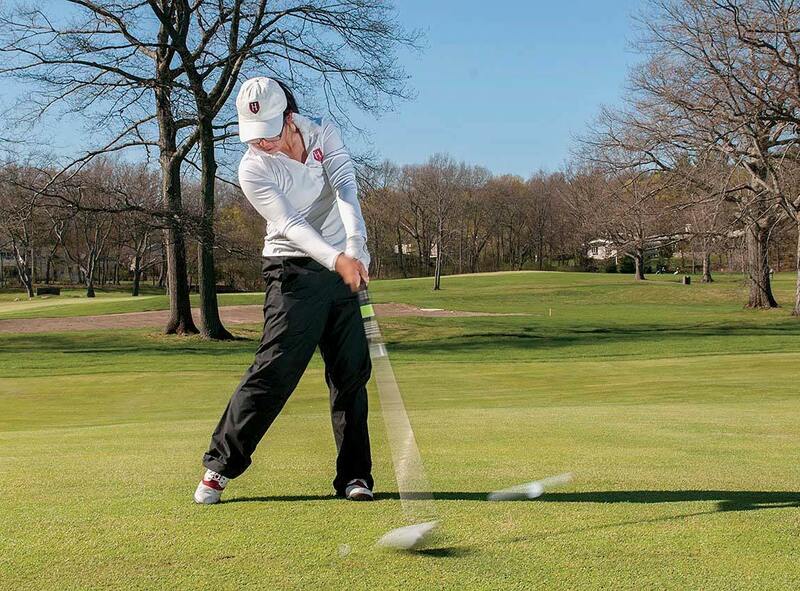 Traditionally, Harvard has not been known as a golf power. The school’s most significant figure in the sport (if you don’t count Bobby Jones ’24 , who didn’t tee it up for the Crimson) arguably is Edward S. Stimpson II ’27, two-time captain of the golf team, who in 1935 invented the Stimpmeter, a device now widely used to measure the speed at which the ball rolls on the greens. But in the last few seasons, under Fred Schernecker ’89, the Weissman director of golf, and coach Kevin Rhoads, Harvard’s linksters have been on a roll of their own. Last season the men’s team captured its first Ivy title since 1975. That group is a bunch of duffers compared to the women, who have won five Ivy championships in a row. The mainstay of the last three titles has been steely Anne Cheng ’17. She has been voted team captain for 2016-17 and will attempt to become the second Harvard player (after Emily Balmert ’10) to be a four-time first-team All-Ivy selection. The hallmark of her game is consistency. In all three of her seasons in Cambridge, Cheng has had the team’s lowest scoring average; for her 24 rounds in 2015-16, it was 75.42 strokes. Her numbers generally stay in the low and mid 70s, no mean feat when weather and course conditions often limit practice time. Rhoads, last season’s Ivy League men’s and women’s coach of the year, marvels at her technical soundness. “She has a super-solid game that is foundationally extremely correct,” he says. “Her [swing] angles are fantastic. Her flow and her dynamics and sequence are also gorgeous to look at. Her putting is super-solid and her short game is solid. All those add up to the lowest scoring averages we’ve ever had.” Cheng is not particularly long off the tee; a typical drive goes perhaps 230 to 240 yards. (“Pretty far for her size,” says Rhoads of Cheng, who weighs 150.) But the ball invariably flies dead straight—right down the sprinkler line, in links parlance, just like the drives of her female role model, Sorenstam. Correction: Due to reporting and editing errors, the print edition incorrectly identified the inventor of the Stimpmeter as Frederick L. Stimpson. The device should have been credited to Edward S. Stimpson II ’27, twice captain of the Harvard team, who was later inducted into the Harvard Athletic Association Hall of Fame for his achievements in golf.